Updated: Thanks to everyone who posted in my chat on Del Rey's StarWarsBooks Facebook page. Sorry I couldn't get to every question -- I must have hit some kind of response buffer for threads or something, because I was a-writing and it wasn't a-posting. In any event, they'll post the final version tomorrow, and I'll try to respond to the ones I missed. In the meantime, I was the guest for the Jedi Journals podcast for Forcecast, now online. Topic: Knight Errant , what else? Oh, here's something. We have a release date and a cover for Lost Tribe of the Sith #6. Busy day! The release dates for #7 and #8 also appeared today: "Pantheon" has moved to July 19, and "Secrets" has shifted to March 8, 2012, to adjust to the Fate of the Jedi release schedule. 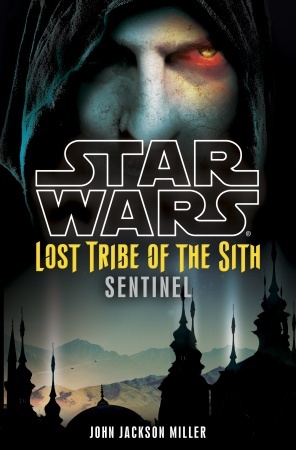 Question about #7 and #8 of the Lost Tribe of the Sith series: Are they going to be a continuation of #'s 5 and 6 or are you going to jump ahead in time like with the earlier installments? I have enjoyed all 6 parts and am planning on purchasing the Knight Errant novel in the near future-keep up the good work! Lost Tribe of the Sith #6: Sentinel now online! Knight Errant Ask-Me-Anything -- and a contest!